The city center is easily accessible by car. But be careful! The Old Town is a labyrinth and many streets are closed for cars. 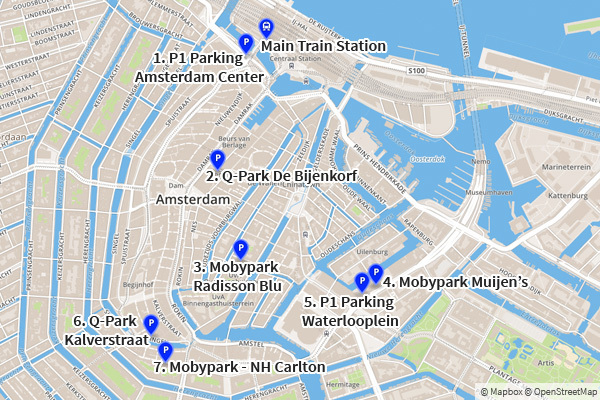 Here you can find out where to park in Amsterdam. Also: Everything about Park and Ride (P+R) and parking at the airport. Illegal parking can be very expensive, by the way. Even if you park your car only for a short time in a parking zone or without a parking ticket, you could get acquainted with one of Amsterdam's notorious parking boots. Parking right by the canal - very expensive and not recommended! If your car is towed, it will cost you at least 150€. So: Always pull a parking ticket and place it under the windshield. With our partner Mobypark, you can book your parking space in advance. The cool thing about it is that it includes parking lots that are not accessible to the public - e.g. of hotels, companies and universities. So you have your parking space safe and you can drive to the city without any hassle. Theft is another risk you might run into if you park in an unsupervised parking lot. Car thefts and smashed windows may not be as common as they used to be, but you still shouldn't leave any valuables in your car. 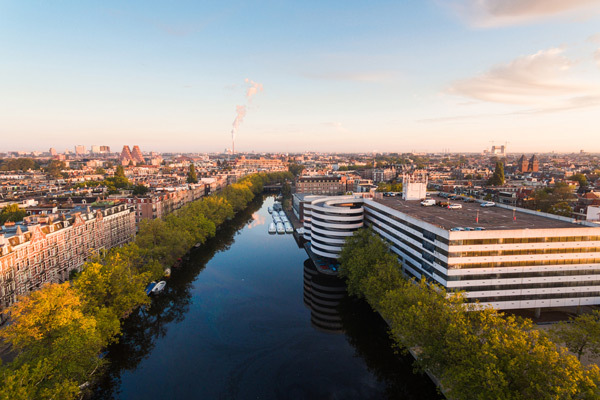 Read on and learn all about Park and Ride in Amsterdam. Park and Ride means: Park your car and continue by public transport. This works very well in Amsterdam. The parking lots are monitored and cheap (from 1€ per day). You can get to the city center in a few minutes by train or bus. Make sure you pay close attention to the P+R rules. Otherwise you may end up with a nasty surprise when you pick up your car. Some parking lots are very expensive when you pay the normal hourly rate. Our insider tip is the parking garage at the Olympic Stadium (P+R Olympic Stadium). The stadium is very easy to reach from the motorway. The parking spaces are clean and safe. You can reach the center by tram in only 20 minutes. Important: The prices apply per 24 hours. Almost all P+R parking spaces are open around the clock (see above for opening hours). In addition to the parking fees, there are also bus, subway and tram tickets. In order to use the cheap Park and Ride fares, you must buy a ticket for public transport. You can find out how to do this by reading the following instructions. The low P+R rates are only valid if you follow a few rules. So, pay attention! Otherwise, you will have to pay the normal parking rates - which can quickly add up to fifty Euro per day. Pull a ticket at the barrier. At some barriers there is an extra P+R button. Some parking garages have an extra P+R entrance. Do not pay by credit card! You can buy tickets at the blue GVB ticket machines at the P+R car park. The discounted P+R tickets are available for up to five people. You can also use a GVB chip card if you already have one. Make sure you check in when you get on the bus, tram or subway. Scan your ticket on one of the devices in the bus. Check out when you leave. Make sure you check in and out again in the Bus or Metro. The last check-in has to be done in the city center. After checking out, you must pay for your parking ticket within one hour. First, insert parking ticket. Then you must scan your GVB ticket. If you have done everything correctly, the discounted P+R rate will be displayed, and you may pay. Payment is only possible by EC (debit) or credit card. Open the barrier with the paid parking ticket and drive from the parking lot. Whew! Finally made it! As you can see, you have to do a lot for one of these cheap parking spaces. But with a little serenity it works out quite well and you can invest the saved money in a tasty meal. 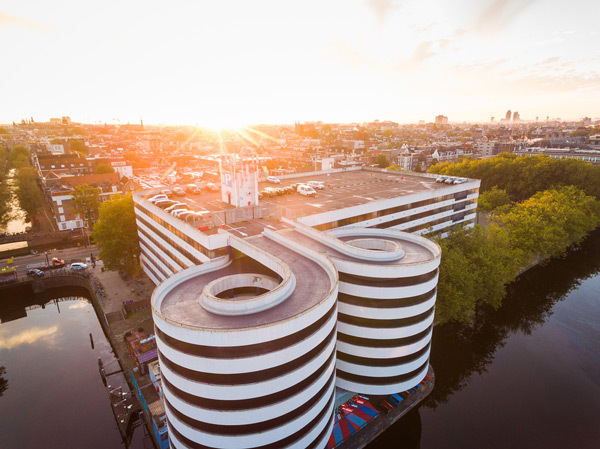 If you prefer to be comfortable, read on and find out where to find the best parking garages in the center of Amsterdam. The large parking garages are the most convenient way to park your car in the center of Amsterdam. Although most parking garages are monitored, you should not leave any valuables in your car. The parking fee for a parking space in the parking garage is between 25 € and 50 € per day. We have compiled a list of recommended parking garages in the city center. The RAI convention center is located in the south of Amsterdam. The connection to public transport is perfect. The Metro 52 (stop Europaplein) takes you to the old town in only 5 to 10 minutes. The best thing about it: At RAI Amsterdam you can park for a whole week from 50€. Book parking space online. You can book and reserve Mobypark parking spaces online. This way you will have a secure parking space and even the prices are a little cheaper. Attention! The excitement remains. In the next part you will learn what you should keep in mind when parking at the airport. Are you flying from Amsterdam and want to travel by car? 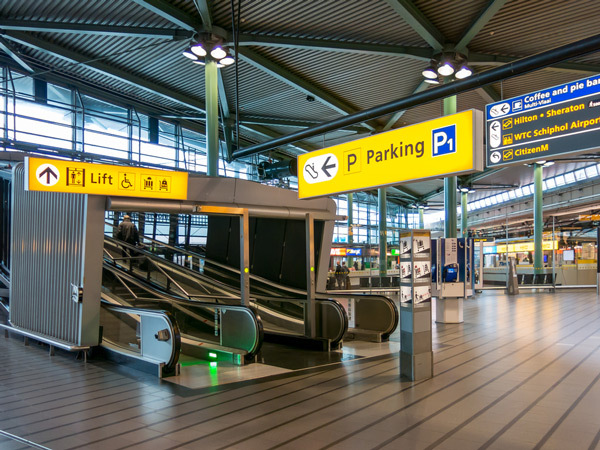 We have compiled all the important information about parking at the Schiphol Airport in Amsterdam. The luxury variant is a parking lot just a short walk from the terminal. But don't worry: You can also find affordable short-term or long-term parking at the airport. Valet parking in particular can save you a lot of money. The airport itself offers parking at relatively fair prices. There is a difference between short-term and long-term parking. A free shuttle will take you to the terminal. Covered parking spaces are slightly more expensive. The price also rises if you want to park closer to the terminal. Tip: Book your parking space online and in advance to get a discount of around 10%. A super alternative with a very good price-performance ratio. You park your car a little further out on a monitored parking lot. An employee of the parking service will drive you to and from the airport with a shuttle bus. The Park, Sleep and Fly offers of some hotels at the airport are an inexpensive and convenient parking option. Offers include one night in a double room with breakfast and hotel parking fees. You can park your car for the duration of your trip (max. 21 days) in the parking lot of the hotel. A shuttle service will take you to the airport. After all the parking possibilities we still have a secret tip for you: Affordable parking at the port of Amsterdam. Read more in the last part of our overview. 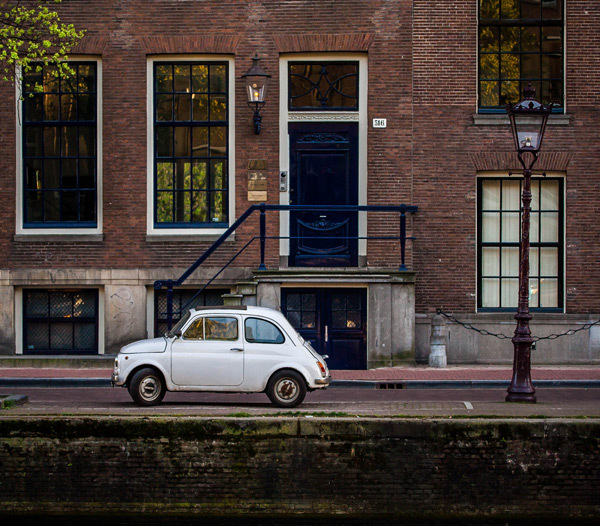 Does your cruise start in Amsterdam or would you like to park your car for a longer period of time? Amsterdam's huge harbor is located directly behind the main train station. We will show you the best parking possibilities at the port. 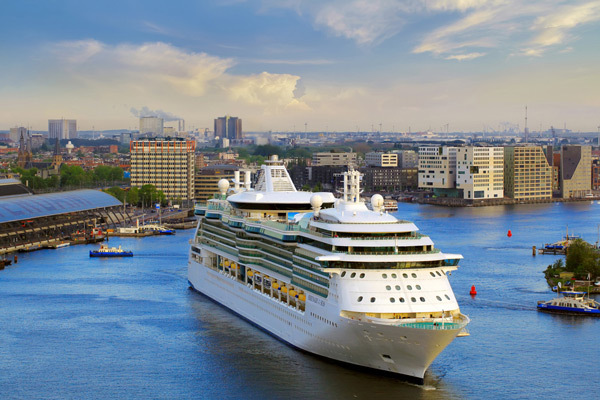 Large and small cruise ships dock at the Amsterdam Port Terminal (PTA - Passenger Terminal Amsterdam). At the terminal, you can see a great spectacle as the ocean liners navigate through the narrow canal with perfect precision. The Passenger Terminal is located directly on the street that also runs past the back of the main station. You can almost see the terminal from the station. The cruise calendar of the passenger terminal indicates when and which cruise ship is anchored. The cheapest option. Unfortunately, the maximum parking time is 96 hours (4 days). Tram #26 runs from the parking lot directly to the harbor. 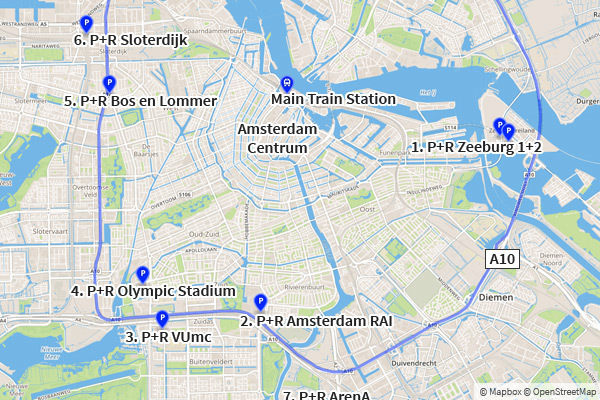 All further information under "Park and Ride in Amsterdam". Your vehicle will be picked up at the pier and taken by the service provider to a monitored parking lot (or parking garage). The service is slightly cheaper than a regular parking garage and can be booked online. Some hotels at the terminal offer an inexpensive alternative. Offers include one night in a double room with breakfast and hotel parking fees. We recommend, for example, the Mövenpick Hotel directly at the terminal. Here you can find a list of other hotels at the harbor. That was our big overview about parking in Amsterdam. Our conclusion: If you inform yourself well in advance and pay attention to a few things, you can park your car well and affordably. Do you have any further tips or questions? Then write a comment. Comments - We’re looking forward to your comment. By the way, you don’t have to sign up. Alias and email address are enough. Just check the box “I'd rather post as a guest“.